Discernment, doing the next right thing, is making decisions while discovering and articulating how God is shaping our lives. Discernment is listening to God in faith to live fully in how he created us and called us to do in his work in the world. Discernment isn’t easy. Sometimes life is confusing. The signs we see are real. Yet we still get lost in this world. I shared this road sign a number of years ago that was erected in a nearby city. Imagine you are driving north in traffic. 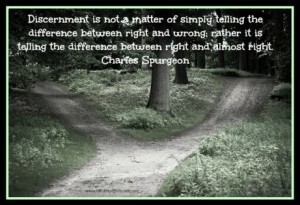 You need to know if you should turn or keep going straight. Quickly what does this sign mean? 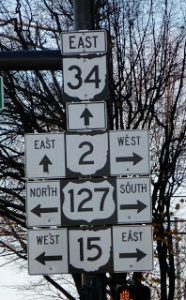 “East is still east and west is still west in my county, Here Ohio 15 runs north and south for the last 80 years, but that is not what the sign signifies. The world shows me puzzling and often misleading notices on how I should live. I want God to say out loud and very clearly, ‘Go this way. To discern mean more than to understand or to make a decision. Dis mans apart and cernere mean to separate. Thus from all the options before us we ‘separate apart’ those that seen uniquely suited to us. We do that when making a decision as well but discernment implies that we take God’s will for us into account rather than simply our own desires. Often on our life’s journey, we are confused. We are not sure where we are going. Where are all these experiences, opportunities, obstacles, lessons leading? Discernment is a major spiritual practice we all need and continue to learn throughout our lives. This is one reason why Emily P. Freeman’s newest book, based on her wonderful podcast, are both called The Next Right Thing. This book is one I am highlighting, underlining, taking into my journaling time and bringing into my quiet time with God. A book full of wisdom and grace and permission not to worry so much about the final results of my decision making but to wonder and explore how I make the choices in life. Cornell University estimates Americans make more than 35,000 decisions every day, including over 200 about food alone. No wonder our decision-making muscles are fatigued. In the Gospels, Jesus models “doing the next right thing.” After each miracle, he gives a simple next step such as go and show yourself to the priest, pick up your stretcher. Jesus doesn’t say here is what the rest of your life will be like or the answer to every prayer – he simply provides the next step. I never noticed that before reading this book. How reassuring! In discernment here are two key questions: What is life-draining? What is life-giving? I used these two questions at the end of 2018 in my deciding whether to continue with the graduate school courses I began earlier that year. I realized my work for my church/parish and my writing was life-giving. They felt like sacred work – where I belonged. My classwork emptied my energy and depleted my spirit. Once I recognized this difference, I knew the answer and withdrew from school. These are just a few examples of the wisdom found in The Next Right Thing. I am still savoring its words and slowly learning new insights. The Next Right Thing is “shelf-worthy.” A book I will keep and reread. What are you learning about the practice of discernment? Let’s share and explore this with each other. I, too, never noticed that Jesus’ instructions to those he healed centered on “the right next thing,” and nothing more. How liberating! Thank you for giving us a taste of Emily’s book. If you’re highlighting, underlining, and journaling in response to it, Jean, it MUST be good! It is such a good book. I bought an extra one for my daughter. Praying for you and Steve! I have been listening to Emily Freeman’s podcast for a few weeks and have just gotten this book and dipped into it. It has already given me tools for handling a painful situation with a family member by insisting we look for “the next right thing in love.” The “in love” part makes all the difference, doesn’t it? I love how you break down discernment. So many things from this book have been a game changer for me. Really and truly, Jean, I need to read this book, too, and will order it as soon as I can. Discernment is a life time practice, isn’t it? And yes, I’m feeling right now like I’m trying to read that confusing road sign you posted here. Lord, how I could use some clarity just about now! Extra prayers for you right now, Martha.